Heat oven to 350° F. Spray six 9-inch round cake pans with nonstick baking spray. Set aside. In a large bowl or stand mixer, mix together cake mix, eggs, butter and water. Mix just until combined. Separate 1 cup of cake batter into 6 small bowls. Tint 1 red or pink, 1 orange, 1 yellow, 1 neon green, 1 blue and 1 purple. 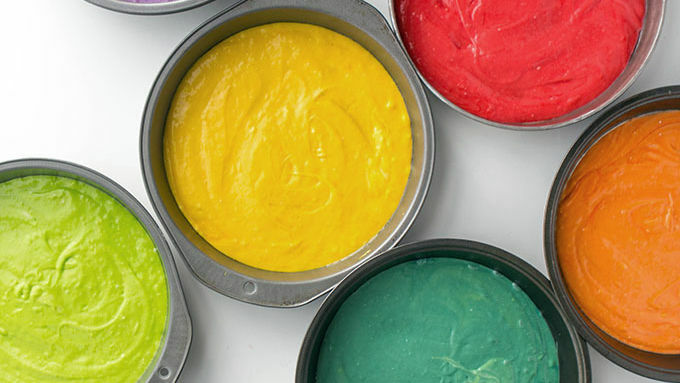 Pour each color into a prepared cake pan. Bake for 12-13 minutes, or just until the center of each cake sets, but not long enough for the cake to brown. Remove and cool completely before frosting. To frost, place Rainbow Chip frosting in a large icing bag. Pipe icing about 1/4-inch from the edge of the purple cake, then pipe a swirl of icing around the inside of the cake. 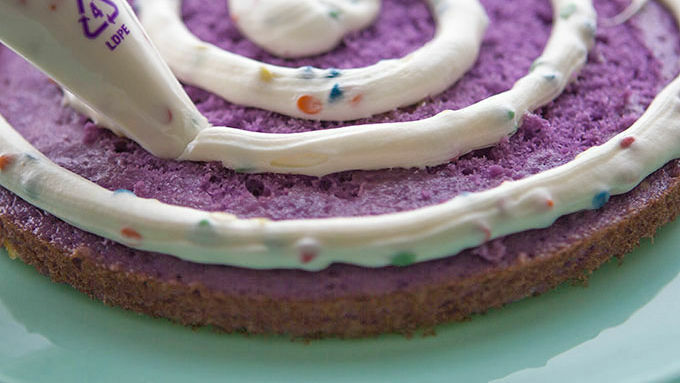 Gently place the blue cake on top of the purple layer. Repeat with green, yellow, orange and pink layers. 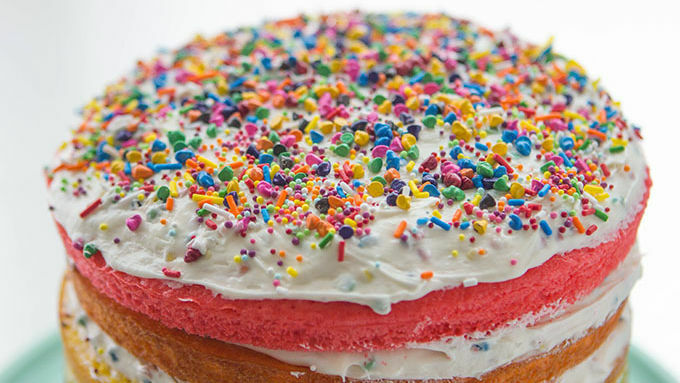 Top with a thin layer of frosting and decorate with rainbow sprinkles. 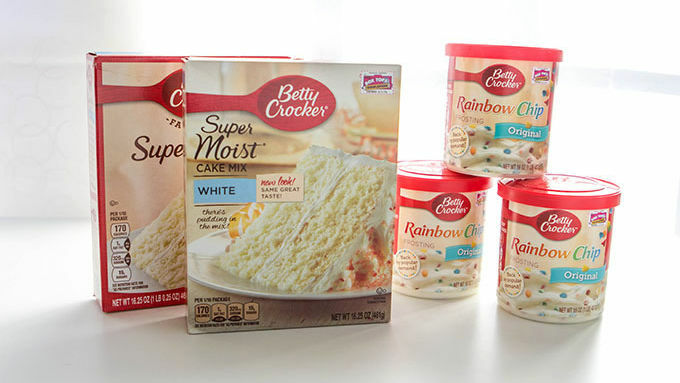 For best results, bake the cakes 1 day before frosting. That will give them plenty of time to cool and settle before stacking on top of each other! If you haven’t already fallen in love with naked cakes, it’s time! 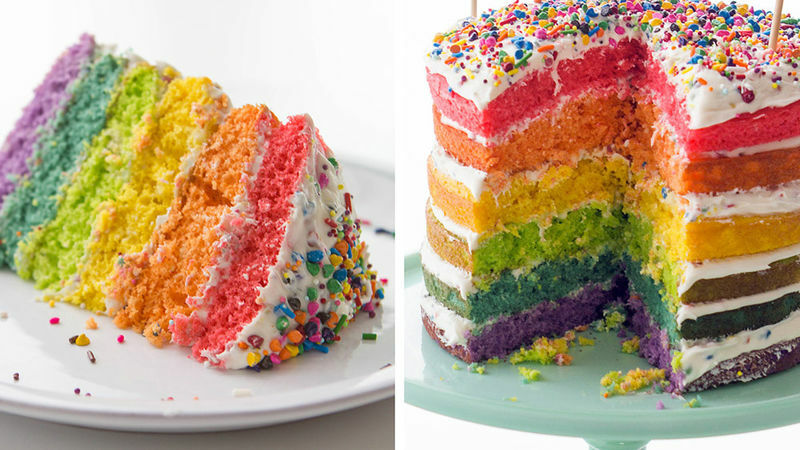 This beautiful trend may be the easiest (and prettiest) way ever to enjoy a cake—and this rainbow version is pure perfection. Have you gone down the rabbit hole of Instagram, scrolling for hours through #nakedcake? This year’s hottest trend, the naked cake craze has reached peak proportions. And we couldn’t help but claim a little piece of the cake for ourselves. Because naked cakes are nice. 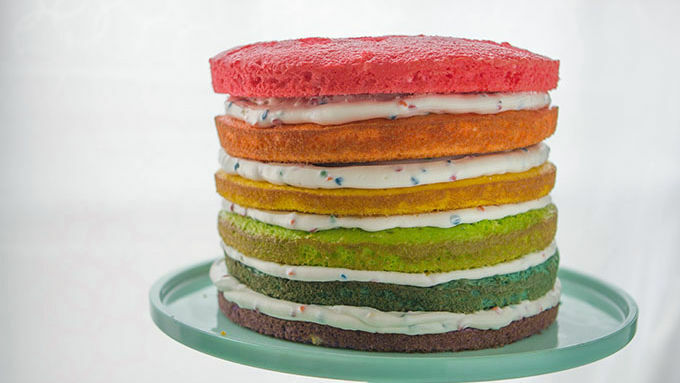 But Rainbow Naked Cakes are really something special. Might we talk for a moment about how much happy this cake creates? Like, so much. Enjoy!